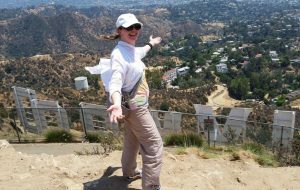 Since I was a teen, I dreamed of walking behind the Hollywood sign. I wanted to see Hollywood with the word spelled backwards in front of me. My first trip to LA (when I was a teen), I saw the sign from Mulholland Drive, which as you may know, is on the hill next to – but not really near – the sign. Still, there was the word, spelled out on the terrain – shining, white letters. What did they see every day while us millions look up at them, dreaming our fantasy of a life in the movies? Many years later, I found the right set of hills and managed a hike toward it, but at the posted warning “no trespassing beyond this point” I turned back. By now I’d be working in the movies for a considerable time. With permission I’d wandered the backlot of Universal “off tram,” attended a party in a Hollywood mansion, and had many other movie-life memories, but not of the view behind the Hollywood sign. I tried a hike from Griffith Observatory, but without a good map and enough water, it was another attempt aborted. Map in hand, sufficient water, hat and supplies, solid footwear and family to support me, we did the hike – crazy that we are – at the heat of the day. The air was thick with heat, the sun burned down on us, unforgiving. The odd lattice-like shadows and a few cool zephyrs provided enough relief to keep us going. Well, that and my dream. The dirt path led to a paved road that winds up, around and right behind the Hollywood sign. Sure, there’s a chain-link fence between you and the sign, but that’s no barrier for the eyes. A rocky outlook perches above the path and fence so you can have an unobstructed view. Up there is the best thing of all: a B&B… a b-ench and a b-reeze. I’m at a loss to describe the feeling, but will try. In that moment, I was a teenager again standing on that other hill gazing over here at the sign (and me), dreaming of the future. At the same time I was here, so many years later with established career in film and my family beside me – an incredible family I never imagined in that teenage dream. I didn’t sit on the letters themselves (as I did in my dream), but I also didn’t need to. From up here, it looked like it would be ridiculously uncomfortable anyway. I know that now… because I’ve been there. Funny thing about dreams: they often come in a slightly different form than when you first imagine them. You have to be flexible enough to accept them as they are and to celebrate them as they come true. You also can’t stop living life to try to achieve them – they happen along the way. So, I’ve now made another life dream of mine come true! Here’s to making more dreams, and then making them come true… all life long! Deb Patz is the author of “Write! Shoot! Edit! 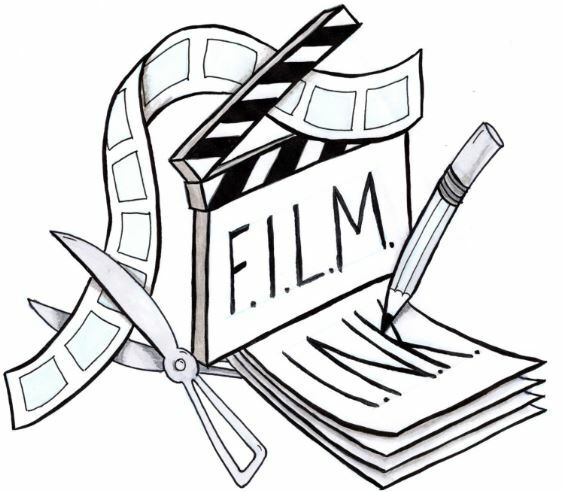 A Complete Guide to Filmmaking for Teens” (new in 2017) and “Film Poduction Management 101” both published by MWP Books. She does not recommend hiking hills and mountains at the heat of a summer day… unless you’re truly prepared for the weather.